As you may recall, I have written that when I was about 16 years old I sat down at my sewing machine (a Singer treadle passed down from my grandmother), with a bundle of polyester material that fell out of the back of a truck and got stuck under my mother’s car and a photograph of my Great Grandparents. I was going to create a dress like my Great Grandmother was wearing. I had no pattern and absolutely no experience sewing historical clothing and had done no research. I didn’t even have a dress form and basically draped the material over me and figured out how it should go so it would be like my Great Grandmother’s wedding dress. I couldn’t see all of the skirt so I made it up. Really, when I think about it, I am amazed at my audacity. The draping alone boggles my mind! Heavens, I’d never try that now! Sometimes it is glorious to see the lack of fear that comes from youth and ignorance! According to family tradition, Alice was the daughter of Mr and Mrs. Benjamin Preston and Edmund was the son of Clara Charsly Watson and Edmund Lister Watson. The family tendency to pass on names became the bane of my father’s youth. My great-great-grandfather was Edmund Lister and my pictured great-grandfather was Edmund Flemming. My grandfather was Lister Flemming and my Dad is Lister. They called my Dad, Lister the Blister in school so he changed his name to his second name and refused to continue with that tradition…much to my brother’s relief I’m sure. Needless to say, trying to track family information gets complicated when everyone has the same name! But, it can also help to ensure you have the right Watson family if one of those names shows up! 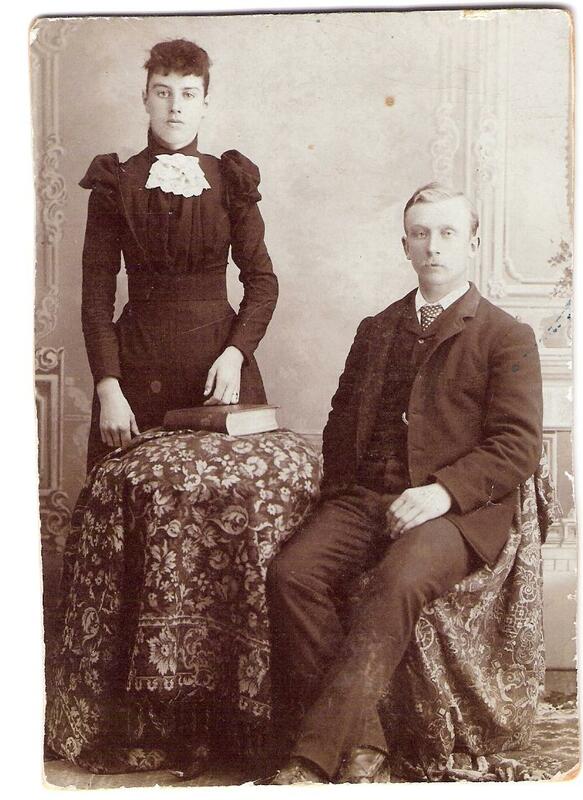 It is also family tradition that Alice and Edmund were married May 6, 1893 in the Penitentiary Chapel in Stoney Mountain. Apparently, there was some teasing about this! Stoney Mountain to this day has one of the main prisons in my province. The photograph is their wedding photo. If you look at Alice’s hair it is in a style that I have seen dated at mid to late 80s. This is not a surprise, Canada was a very young country so they would be behind the States by a couple of years and according to my great-grandfather’s journals, they seemed quite religious and farmers of moderate means. I’m thinking that hairstyle would have been seen as more conservative and practical. Alice would have been 17 years old (icky) and Edmund 27 (double icky) if family records are right. One would assume with her youth that she would be more cutting edge than she was (at least with her hair) so it must have been a case of Canada being behind and them being conservative. Does anyone have any experience dating dresses based on cut? I’m wondering if it was cutting edge or simply a tried and true practical pattern. This photo is in better shape than this scan shows. My Grandfather had it in his possession (in his dresser drawer) and he passed it on to me one day saying he wanted me to have it as I reminded him of his mother. I can see it a bit in her eyes I guess…. Anyway, until recently, the photo was in a box in my basement for years so it hasn’t seen a lot of sunlight or other dangers. I have it up now but I am careful to make sure it stays under glass and turned away from any windows in the room. If anyone out there has any other suggestions to make sure it remains in such good condition I’d love to hear it. This entry was posted in About me, antique photos and tagged great grandmother, watson family. I’m glad another family member has the chance to keep these too alive with photo names and stories! Oh cool! I guess that makes us kinda cousins! I’d love to see them! If you scan them, you can send them to me. I have a few too from when they were very old. Around the 1930’s I think.